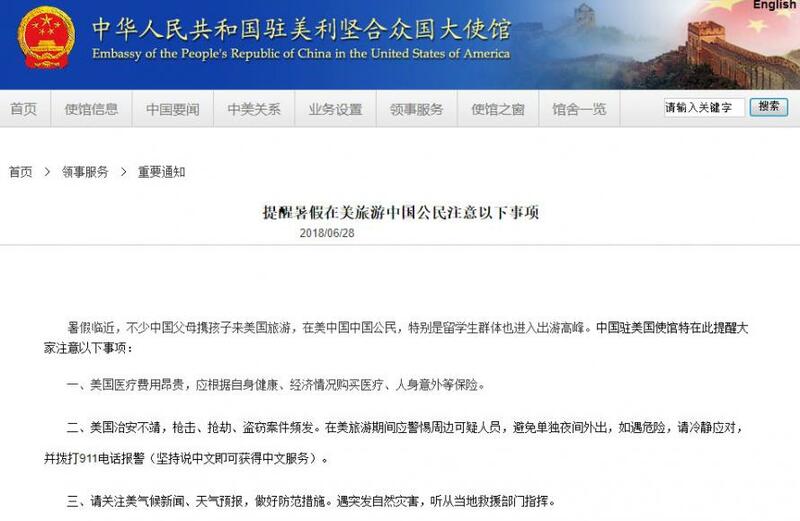 The Chinese Embassy in Washington issued a security advisory last week, warning Chinese citizens traveling to the US that "shooting, robbery, and theft are frequent." Tourists were also warned to “be alert to suspicious people around you, avoid going out alone at night." In addition to getting killed and mugged, the embassy warned Chinese tourists to be aware of issues including expensive medical bills, searches and seizures by customs agents, telecommunications fraud and natural disasters. Further trolling the US, the alert published on the embassy's website last Thursday said that "public security in the United States is not sufficient. Cases of shootings, robberies, and theft are frequent." Commenting on the notice, China's Foreign Ministry said summer is usually the peak season for Chinese citizens to visit the US and that it was the Chinese Embassy's duty to warn tourists about potential risks in the country, in response to questions over if the warning is related to the tensions between China and the US. “This kind of reminder from the Chinese embassy in the relevant country, I think this is absolutely a matter that is in the scope of our duty,” ministry spokesman Lu Kang told a regular news briefing quoted by Reuters. There was little mention of the latest embassy alert on Chinese social media. While China frequently issues travel warnings for Chinese abroad - generally in war-afflicted regions - some foreign governments have argued that Beijing uses other means, such as curtailing outbound tourism, to settle political or trade scores, though the Chinese government typically denies such issues are linked. Still, for much of 2017, China banned all group tours to South Korea in the wake of Seoul’s decision to install the U.S. Terminal High Altitude Area Defense system (THAAD), which has a powerful radar Beijing worries can penetrate Chinese territory. China may be right: according to a 2015 University of Alabama study, Yemen is the only other country in the world with a higher rate of mass shootings, adjusted for population. More ominous, however, is that tourists seem to believe the heightened risks, and are putting their US trips on hold: the U.S. has experienced a drop in foreign tourist arrivals, which some have dubbed the “Trump Slump.” Critics are attributing the decline to current political rhetoric and the travel ban, which was upheld by the Supreme Court last week. Travelers from seven predominantly Muslim countries — including Iran, Libya, Somalia, Syria and Yemen — are currently barred from entering the U.S. In 2016, nearly 3 million Chinese tourists visited the U.S. According to Travel and Leisure, not only are there more Chinese tourists around the world than any other nationality, they’re the most likely to spend money while traveling. In one year, Chinese travelers are estimated to have spent $261 billion abroad.